The Round Trip Quilts have finally started their journey! 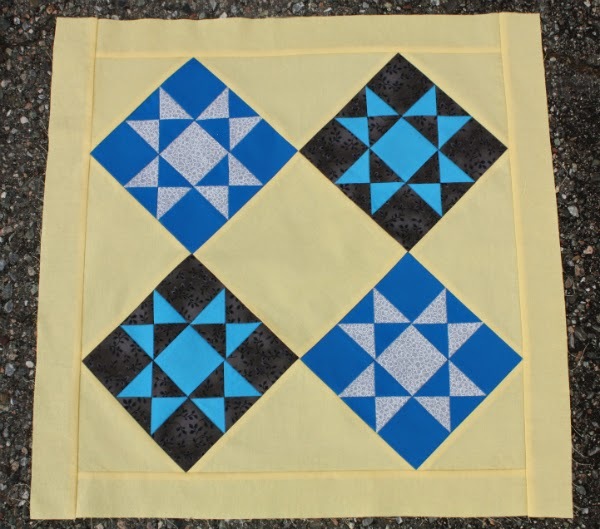 While I certainly wasn't wishing the summer away, I have been anxious to mail my quilt's starting piece and to see what all the others in the group decided to make. I'm going with a star theme for my quilt, which certainly leaves lots of room for everyone else to play. How many star blocks are there anyway? I made four Ohio stars as the starting piece and I can't wait to see what it becomes as each person adds to it. I probably should have made it scrappier, to help it blend in with all the different fabrics that will be part of the finished quilt, but I had it finished before I thought of that. I guess that's what comes of having never done anything like this before. I have full confidence in my bee-mates though. The finished product will be amazing, I'm sure. I put it in the mail yesterday, headed to Mary of See Mary Quilt. Now I'm waiting for the starting piece sent to me by Jennifer, of Never Just Jennifer. Her starting piece is absolutely beautiful! I already have an idea of what I want to add to it, based on what she has already shared of what she envisions for her quilt. In other news, today was the first day of school. Nathan was pretty excited because he's in grade 1, which means he's now in school full days, so he can eat lunch at school. 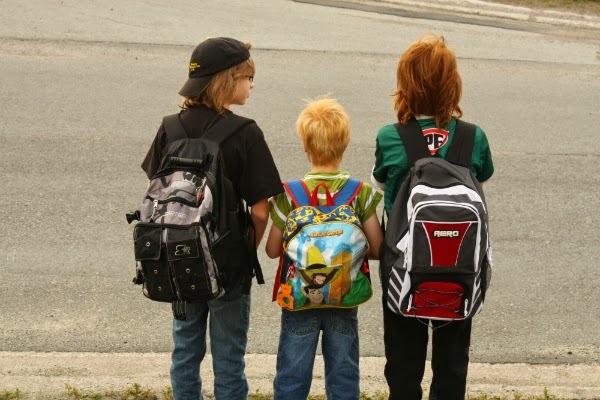 He can also go on the bus whenever he wants, instead of only when one of his brothers would go with him (they prefer to go with Dad, who teaches at the same school). Aiden is in grade 7 (junior high!) and Zachary is in grade 5. 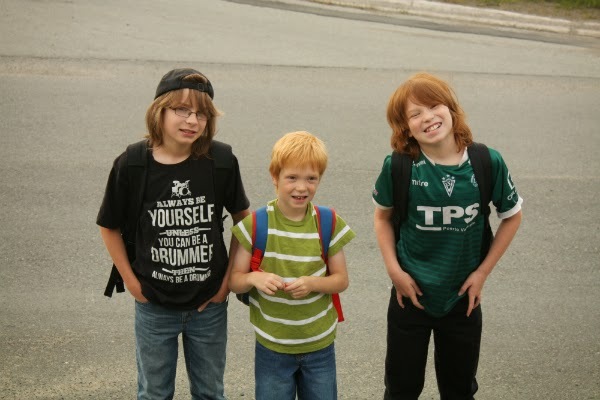 It's almost impossible to get a picture where all three boys are looking at the camera, everyone's eyes are open and no one is making a funny face! Oh the fun is going to start now! I am going to enjoy watching what you all create! Your blocks look great! And how exciting they are all in school full time.